Delivery firm Hermes is facing a possible investigation after a report alleged some of its drivers receive below the minimum wage. Business minister Margot James has requested HM Revenue and Customs look into arrangements used by the firm. 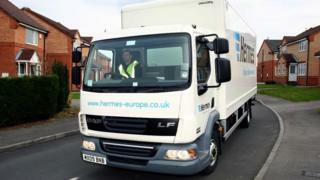 She was responding to a report by MP Frank Field into complaints from 78 current and former Hermes couriers. Hermes said it would co-operate with an investigation, but that the report "does not reflect" the way it operates. Mr Field's report, which was sent to Prime Minister Theresa May, said Hermes's practice of employing its drivers as self-employed workers sees many of them "paid an hourly rate that is much lower than the National Living Wage". Several couriers said their monthly earnings, after petrol costs, were less than £6.80 an hour, 40p an hour below the National Living Wage. Mr Field, a Labour MP, told the BBC he was "delighted" at Ms James's response: "It shows the government has changed step on how it responds to these reports." His report also claimed there was "serious bullying from some of the middle-men and women who manage the operation for Hermes and who seem to be enforcing an employee contract under the cover of self-employment". A courier who lost their job after their car broke down during a round, and being told by their manager that they should have had a spare car. In a statement Hermes said: "We do not believe that this report reflects the way our organisation operates." It said it was "committed to ensuring that everyone at Hermes operates in a supportive and compassionate manner", and its code of conduct states couriers should be treated with "dignity and respect". "The report is not independent and it has not been discussed with us. However, we are pleased that it does acknowledge some of the actions we have taken to further support our couriers," Hermes said. It also pointed out that of the 10,500 couriers who provide services to Hermes, only 78, or less than 1%, have commented in the report. Hermes said its couriers were paid an average of £9.80 an hour after expenses, which was above the £7.20 compulsory National Living Wage. The firm also said HMRC had reviewed its courier model in 2011 and confirmed that it was legitimate. "We will co-operate fully with any investigation," it added. The government does not plan to launch its own investigation into Hermes's working practices, Ms James said in her reply to Mr Field. The business minister said: "However, we will continue to monitor the situation and I will pass your letter to HMRC, who can consider the relative merits of proactive investigation, even in the absence of a complaint, alongside other investigative priorities." An HMRC spokesperson told the BBC it did not comment on individual investigations. But the tax body added: "When HMRC investigates whether the National Minimum or Living Wage is being paid they look at the reality of the working relationship, not just what the employer calls the contract." Employers "cannot simply opt out" of the minimum wage by defining their staff as self-employed, "even if the worker signs a contract to that effect," it said.